Amazon reviews are still a burning issue for many Amazon sellers due to the fact that Amazon reviews help product rankings and increase conversions. 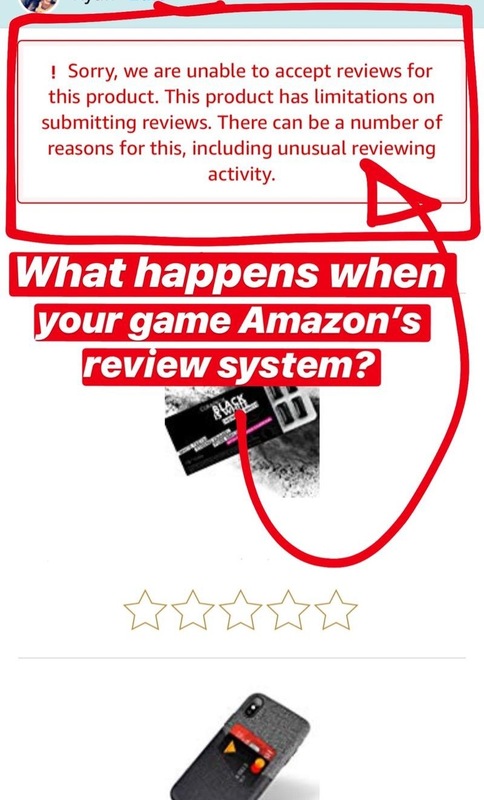 But if you try to game the system by increasing the number of reviews, things like this will happen… What we know is Amazon is a learning platform, if there is any issue it resolves it in the best way possible. So the big question… How, in 2019 can we increase our product reviews? Below we have put together some FAQs to help you. Can you sell well without reviews? Yes, if the product is unique and obviously in demand, a lack of reviews or no reviews does not matter. We have done some work with an Amazon US account lately and you can see sales went from 0 to 12K in just a month. Can you give products away and refund the customer via PayPal to get reviews? Of course, you can and this is a very popular method lots of sellers use, but the risk is account suspension. How does Amazon know the reviews are not genuine? If you have an influx of reviews, the system will flag it up. Similarly, if one user writes multiple reviews (usually > 2) the system will flag up a warning. What are the risks of influencing reviews? Does Amazon remove fake reviews? What about an automated email system like Xsellco? Does this help? We have proven results that this helps. The key to getting this right is by putting the right message across, and the timing of the email sent. There is no one set rule no matter what experts say. So, don’t be scared of experimenting. I am an Amazon Vendor, what’s best for me? As a vendor, you have the advantage of using Amazon’s Vine programme which is expensive but a quick way to start building up reviews. The quicker the result the quicker the sales growth. So, this makes perfect sense. I have both Seller Central and Vendor Central Account. What’s best for me? You have a great advantage. A lot of Vendor holders are not allowed to have seller central accounts but this is not global. We are aware our vendors are warned not to open seller central accounts as they may close their vendor account. If you do have both accounts for some time then you can launch the product on SC account and generate reviews and launch them on VC and start getting POs quicker than normal. What are reviews with “verified purchase” labels? These reviews are written by a consumer who actually bought the product. What are some other ways to get Amazon reviews? What about most helpful likes? Most helpful likes put your reviews on the top of the list. Say, for example, if your negative reviews are sabotaged by a competitor and upvoted then it stays at the top and your sales definitely go down. This is based on real-life experience. Is there any place I can buy reviews? Appsally seems to be the most popular way to generate quick reviews but please be warned you can get suspended. How is Amazon detecting fake reviews these days? It is always best to stay within Amazon’s policy and stay away from any quicker wins as it will only mean account suspension. Have you had any quicker wins with regards to getting reviews?